Multitasking has become a part of our lives. We are doing it all the time. Surfing, watching TV, reading newspapers and having our meal all at the same time — this is just one small example. Multitasking has become the way of life in modern age. Trying to do one thing at a time does not seem like a sensible thing anymore. While most of us indulge in several activities at the same time thinking that we are saving time, the actual fact is that multitasking makes us slow and less efficient. So, here are ten reasons why multitasking reduces your productivity. Multitasking in no way saves time. It actually slows you down. Our brain is not a machine, switching between two tasks in short span of time is not as simple as switching between two windows of your computer. Changing focus from one task to other and then coming back to the first one is not something that a human mind has been designed for. 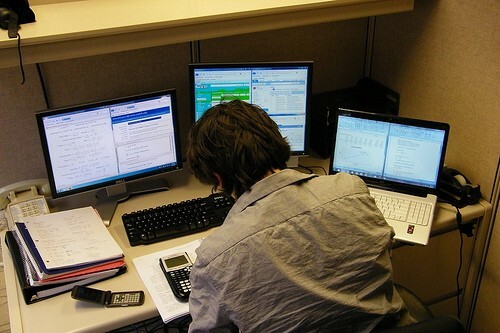 How does multitasking affect the energy levels of human body? Multitasking creates mental blocks that can reduce the productivity by 40%. Although physically it is easy to switch from one job to the other, mentally it is not possible to adjust immediately to the requirements of the new task. Scientifically it has been determined that people get slower when they multitask than when they try to repeat the same task — this is because in the latter they don’t have to switch to new set of requirements, the mind has already worked on it before and knows what needs to be done. There was an era when ailments related to heart and blood pressure occurred amongst those who were beyond fifty years of age. It was also believed that women generally don’t have the risk of any sort of heart ailments but modern day life is very demanding. We have set several goals for ourselves and try to accomplish too many things together in one go as a result of which nowadays we see youngsters falling prey to such ailments. Several youngsters develop high blood pressure problems in their mid twenties. Women are no exception. How can we avoid stress caused due to multitasking? In today’s world there are lots of job opportunities but at the same time there is tremendous pressure to perform which creates stress. If you take out just one hour from your precious time at the beginning of every month and plan your work, things would be a lot easier. We develop a habit of multi tasking because we are not able to set our priorities right. Juggling too many tasks at one time can be quite stressful. One brain is meant to handle one task at a time. By multitasking we multiply the stress level in our body. A well planned life, meditation, exercise and healthy diet are very essential to maintain good level of productivity. Multitasking does not allow you to focus any task properly and correctly. While you think that you are doing too many things together, the actual fact is that in reality you are just trying to shift your focus from one task to the other in short span of time. This slows down the mind and it starts skipping things which means that there is high probability of skipping important things and making errors. Think about this — if you are watching television and surfing the net at the same time and suddenly there is an important phone call, if you don’t mute the volume of the television and keep your laptop aside you would probably not answer the call correctly. This is because of short term memory loss caused by stress hormones in the body. It becomes difficult to register things and respond promptly. Therefore, multitasking makes you busier. We spend most of our time correcting our mistakes rather than trying to achieve something new. Most people who indulge in too many things at one time cannot aim higher in life because they spend most of their time taking corrective measures. You get so stuck up in the web of tasks that you tend to miss out a lot in their real life. You are unable to register anything that is happening around you. Memory loss and absentmindedness is very common amongst those who try to do too many things at one time. Trying to remember too many things at one time can have an adverse effect on your memory. People who indulge in many activities at the same time are often absentminded because the brain is not designed to handle tasks of different requirements at the same time. Short term memory loss is inevitable in multitasking but if you don’t change your habits this can do a permanent damage to your memory retaining abilities. Memory loss is becoming very common amongst new age youngsters. Most people who are multitasking have the tendency to put on weight. Many people eat irregular meals or skip meals which slow down the metabolism rate of the body. This is why more than 70% of people leading a busy life have weight related problems. If multitasking really saves time then why is that people are not able to take out time for work outs or exercise? Why is it that one is not able to take out 15 minutes of his time to have proper meals. 8. Multitasking reduces your ability to think. You may be able to work on several tasks but you will face problem in working on something that require problem solving. This is because you are so busy switching between tasks that you lose the ability to sit and think over one matter. Certain things in life require dedication, time and complete attention and this cannot be done while multitasking. In short, multitasking is not a solution to any problem. There have been several achievers in history who were multi talented and achieved a lot in life. The idea is to plan our life and get rid of distractions. It is important to focus on one thing at a time and for that it is necessary to set your priorities right. Most importantly, learn to say “NO” to things that you cannot handle.